Vassar's relationship with France has been long and affectionate, going back to the construction of Main Building, modeled on the Tuileries Palace. Since that structure was so severely damaged in the fighting during the Paris Commune in the spring of 1871 that it had to be demolished, architectural historians look to Main Building to get a sense of the visual presence of the original. If the marvelous 1888 novel by Elizabeth W. Champney '69, Three Vassar Girls in France, is based on the experiences of real alumnae, members of the Class of 1869 encountered some dramatic adventures during the siege of Paris by the Prussians, September 1870-January 1871. While they recognized the weakness, even the decadence, of the French Second Empire which had collapsed in military defeat, Champney's girls were all resolutely Francophile. One of their number, Sallie Benton, believed that Bismarck's new Second German Empire was founded upon an "iniquitous system." Moving from fiction to history, Lucy Maynard Salmon, who founded Vassar's history department in i886, took her first sabbatical in 1898-1899. (1) Naturally Professor Salmon went to Paris, where she became an ardent supporter of the falsely imprisoned Captain Alfred Dreyfus. She reported in her correspondence that all the academics she met were Dreyfusards, and this stern and reserved woman wrote that she shed a tear for the supporters of the martyred officer. 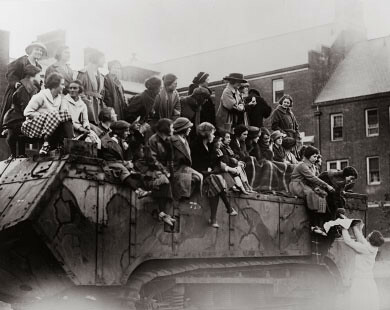 In October 1920, the French government offered the tank to Vassar, and President MacCracken accepted it. Delivery to Josselyn hockey field was set for Armistice Day, November 11, 1920. Arrangements were made for a dramatic welcoming ceremony, well documented in the local press and in contemporary Vassar publications. The Poughkeepsie Eagle reported that the event was filmed. (6)) The entire student body was present, marching past the reviewing stand and around the tank "to christen it," carrying the French and American flags, and singing the Marseillaise and the Star Spangled Banner. Among the speakers were M. de Sanchez, representing the French government, Mireille Holland, Class of 1922, speaking (in French) for current students, President MacCracken, and Ms. Lambie on behalf of Vassar graduates who had served overseas. "We expected no gift. Our reward was in the doing. This tank resting on the peaceful campus will serve as a reminder of the world tragedy." After residing two decades on the Vassar campus, the somewhat rusty vehicle was towed away and cut up for scrap metal, some of which was perhaps refashioned into new weapons for a new World War. A number of legends have sprung up about the French tank, some of which may have basis in fact. Supposedly during Prohibition bootleggers used the tank as a drop-off point for illicit liquor. There is a story that President MacCracken was taking an evening constitutional, when he noticed smoke emerging from the tank's cannon, generated by Vassar undergraduates illegally smoking inside the tank. The story as reported to this writer is that he continued on his stroll and did not interfere with this student activity. Finally, I have been told that workers dismantling the tank discovered unexploded ordinance in a neglected compartment, suggesting that the smokers were lucky indeed! Twelve years of non-stop teaching seem overwhelming to contemporary faculty, such as this writer! Indeed a claim was made that it was the largest war relic in America. Additional information kindly supplied by M. Michel Souquet, 7. 14. 2015. Information from the Verdun memorial plaque honoring Vassar. Amazingly, given the diversity and productivity of their efforts, only six alumnae are listed as members of the Goutte de Lait group. One citation gives the total number of alumnae who served in the Allied war effort as 200; an accurate count is probably not possible. From Le Bulletin Meusien, August 17, 1919, my translation. To my knowledge no film record survives.